Arizona's 4th congressional district is a congressional district located in the U.S. state of Arizona. It stretches from the periphery of Phoenix to contain much of the rural western and northwestern portion of the state. Arizona's 4th congressional district - since January 3, 2013. It is currently represented by Republican Paul Gosar. The current 4th was created after the 2010 census from portions of the old 1st, 2nd, and 5th districts. It is the only district that is not a geographic or demographic successor to one of the districts in the 2003-2013 map. 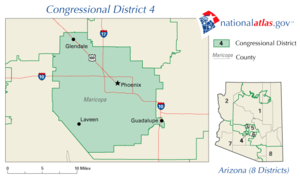 Prior to 2013, the old 4th District was a majority-Latino district located entirely in Maricopa County; most of that area is now the 7th District. Arizona first gained a fourth district after the 1970 Census. It covered the entire northeastern portion of the state, from northern Phoenix all the way to the New Mexico border. However, the great majority of its vote was cast in northern Phoenix, which was heavily Republican. With the Valley's dramatic growth over the next two decades, the district was made significantly more compact in the 1990 Census, losing all of its territory outside of the Phoenix area. Like its predecessor, it was reliably Republican. After the 2000 Census, the old 4th essentially became the 3rd District. A new 4th District was created in the heavily Latino portions of inner Phoenix. This district was the only safe Democratic district in the Phoenix area, and remained in Democratic hands for its entire existence in this configuration. After the 2010 Census, this district essentially became the 7th District, while a new 4th was created in the mostly rural western and northwestern portion of the state. While the old 4th was easily the most Democratic district in Arizona, the new 4th is far and away the most Republican district in Arizona, and one of the most Republican districts in the West. In both presidential elections contested since the current 4th was created, it gave the Republican presidential nominee his highest margin in the state. Arizona began sending a fourth member to the House after the 1970 Census. 94th Apache, Gila, Graham, Greenlee, Navajo, Maricopa (part), Pinal (part) E Arizona, including parts of Metro Phoenix First elected in 1972. 97th First elected in 1976. 102nd First elected in 1986. 107th First elected in 1994. As of November 2018[update], there are three living former members of the House from the district. ^ Martis, Kenneth C., The Historical Atlas of United States Congressional Districts, 1789-1983. New York: Macmillan Publishing, 1982. ^ Martis, Kenneth C., The Historical Atlas of Political Parties in the United States Congress, 1789-1989. New York: Macmillan Publishing, 1989.